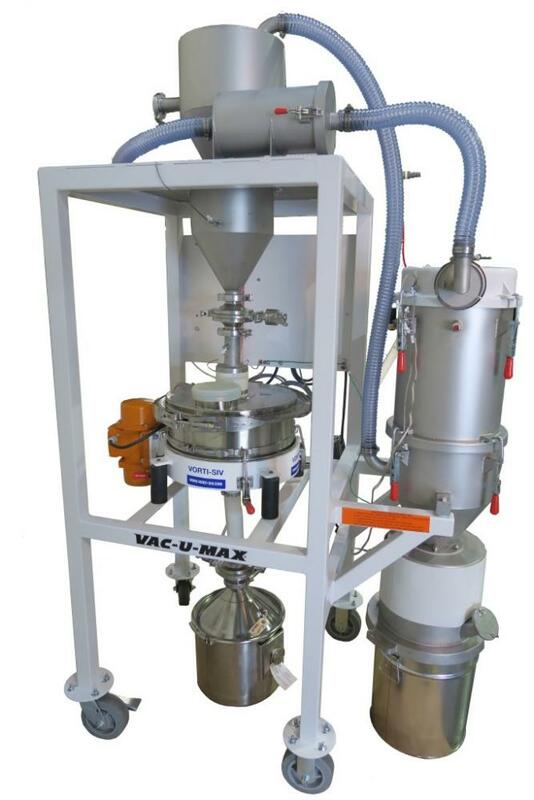 Vac-U-Max introduces a new Metal Powder Recovery System (AM-MPRS) for additive manufacturing/3D printing applications that now offers conveying, screening, recovering, and reuse of metal powders, including Inconel, stainless steel, Haynes 282, and cobalt chrome. The AM-MPRS increases productivity of additive manufacturing/3D printing machines by extracting metal powders from the printing bed via vacuum, and then sieving the metal powder for future use – cutting metal powder recovery time by 85%. The new AM-MPRS is designed for ease-of-use, conveying metal powders in a closed system, eliminating operator exposure to metal dusts, and maximizing plant and personnel safety. The AM-MPRS utilizes vacuum, with system extracting the metal powder, conveying it to a vacuum receiver, and then discharging the metal powder into a sieve. The sieve discharges the metal powder into a pail, drum, or IBC, in a contained and inert environment. The system is NFPA 484 compliant for handling metal powders and reduces risk of cross-contamination. The AM-MPRS allows full metal powder recovery and quick dismantle without tools. The ergonomic low-profile design and mobile frame allows easy rolling with lockable casters. The AM-MPRS includes pick-up hand tool and static-conductive hose with smooth bore. Hoses for non-aerospace applications are available in PVC construction, both FDA and USDA approved. Aerospace applications are offered with flexible stainless-steel hose with smooth bore construction. The AM-MPRS offers inert gas-purge fittings and optional gas-purge manifold supplied at customer request. Additional features include a HEPA filter canister with filter, and high-output suspended vibratory sieving machine with US230 mesh, ultrasonic de-blinding kit, and a vacuum receiver. The 316L stainless-steel vacuum receiver package offers 36 sq ft of filter area and counter-weighted discharge valve. Vacuum generator includes a single venturi power unit. Compressed-air is driven by a vacuum generator with ½-in. NPT high-pressure air connection. The system requires 35CFM @ 60 psi for operation, with variable orifice assembly for adjustment of vacuum levels. A NEMA 4, UL-Certified control panel offers micro-PLC for vacuum conveying functions, starter for sieve, grounding and bonding monitor, and face-mount ultrasonic controls.